SYM HD 200, for a commuter scooter ya can't beat her! The SYM HD 200 has what it takes to be reliable (read starts every time), flickable (urban commuting) strong for its size, (Rocky Mountain foothill highway), saves gas at approx. 55-60mpg. The top speed I've seen is 80 mph. I test rode all the Vespas, Aprilias, Kymcos, etc. and the SYM came out on top in her price point - without any problems in her first year and 4,000 miles. Lil SYM, you go girl!!! My daughter will turn 16 this summer, so we needed to get a 3rd vehicle. Paying for the gas, insurance & upkeep of another car seemed daunting. Since I only have about a 4 mile commute on city streets, two wheeled transportation was an easy choice. After reading many reviews and taking a few test drives, I decided on the SYM HD 200. I am 5'9" and 240lbs. I figured a 171cc engine would be bogged down and slow. I was wrong! I am usually way faster off the line then most cars and it maneuvers easily in traffic. The larger wheels make it handle and corner like a dream. Even after sitting for a few days, it always starts with the first push. I find myself doing errands on it just for the fun of riding it! I put a top case on it to carry my gear to work and lock up my helmet. Plus the "Motorcycle" parking at work is right up front, closer than any of the other employee parking! The sidestand... It is spring loaded and can easily flip up and drop the bike. Just use the center stand. Underseat storage. Even though it is shaped like a helmet, you would have to have a Rhesus monkey size head to get your full face helmet in there! No cup holder. Hey! this is Portland! If I can't carry my Starbucks I go through withdrawal! Overall love the machine and would highly recommend it. This SYM HD 200 scooter is my first scooter and I just recently bought it. I plan to use the scooter primarily for commuting to work. Of course, there will be some "fun" rides here and there too. 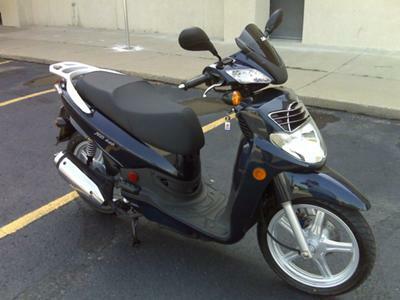 After doing some web research, including discovering Kathi's web site, I decided that a 150cc scooter might fit my needs. I found a great dealer here in Wichita called "A Wheeled World" that sells Genuine and SYM scooters. I was initially interested in the SYM HD 125 model, which is virtually identical to the HD 200 I bought, except for engine size. The dealer thought the HD 125 model was just a tiny bit underpowered, compared to other 150cc type scooters. The 200 model I have actually has a 171cc engine in it, so SYM is guilty of rounding up a bit, but who cares. 16 inch wheels... Supposedly a bit smoother ride, not sure, but they look great. Liquid cooling... Rare for a scooter. It actually has a radiator. Maybe makes it a bit quieter. CARB approved... Street legal in California. Maybe not that important here in Kansas where I live, but I don't like to pollute. Power... Really nice acceleration. From a standing start, I can get to 35 MPH very quickly. Sporty look... My daughter has a Vespa and it's a very nice scooter, but I am just not in love with the Vespa type of styling. 2 year warranty... Way better than the 90 day warranty for some other scooters. Headlight... A 60 watt halogen bulb that I was very thankful for the first time I rode it at night. Storage space... Not near enough for me, but keep in mind, I am used to a small pickup truck. No cup holders... How the heck are you supposed to sip your Starbucks latte on the way to work in the morning. Fueling issues... I have trouble getting the tank really full when I fill it up. Probably just something I'll get used to and better at as time goes on. But I am definitely not complaining about 75 MPG! All in all, I really love the SYM HD 200 so far and would recommend it to anybody. I hope to have a great relationship with this scooter for many years to come. Apollo Motor Sports of Houston loaned me a brand new SYM HD200 scooter (because my scooter was in their shop) for a group ride in the Texas hill country. The group consisted of one SYM 200, three Bourgman 400s, one Yamaha Majesty 400, one MP3 500 and two motorcycles. I was the smallest ride in the pack. We rode the hill country for two days. I rode with the group the first day but kept the scooter below 55 mph and could not keep up when the larger scooter were running 70 MPH. on the straight a ways and they were holding me up in the curves so I elected to ride solo the second day. The second day was much better and I was able to really enjoy the SYM in the curves. I was impressed with this scooter for many reasons and would like to share them with you. The scooter had very good acceleration from a standstill and has good acceleration up to 55 MPH. There was no throttle hesitation when accelerating at low speed. The scooter is well balanced and very easy to ride. Easy to put on center stand. The instrument panel is well lit and easy to read at night. The scooter started with no throttle the instant the start button was pushed. The brakes were good but I never had to really do any hard braking. I liked the gasoline fill cap. It was not under the seat. The coolant level could be seen without removing any panels. The scooter got 75 MPG through curves, and hills at 55 MPH. I am 5ft 10 inches tall with a 32 inch inseam and the seat fit perfect. The stock windshield is adequate with ear plugs. I have a half helmet and the wind noise was high without earplugs. Now for the items that could be improved on with accessories. I do not know why anyone would buy a 49cc scooter when for just a little more they could have a HD200. This scooter could be the first scooter and you may never need to move up. I believe this scooter is capable of running 70 mph and I would not be afraid to run the interstate for a short distance. If a person did need to move up there is the SYM Citycom. I do believe that Honda and Yamaha may have some strong competition from this scooter. This is just my opinion and it is worth what you paid for it.. This thing is AWESOME! I picked up a used SYM HD200 '09 scooter with 2300 miles in perfect shape for around half the retail price of a new one. If I'd known scooters like this existed, I'd have been commuting on one a long time ago! SO much better than a motorcycle - no shifting or clutch work necessary, so when the light turns green just twist and squirt ahead of traffic. This baby has great acceleration, great handling and a smooth, comfortable ride. The spring-loaded kickstand has been remedied for '09, but I still use the center stand most of the time - even in my garage, as it's very easy to push up on there. If I'm returning a video or getting gas I may just flip down the kickstand. POWER - just flies for a 171cc scooter. Handling - you can really lean this thing in the corners and it grips like a cat. Fun factor - who needs a motorcycle? Hop on this and get great acceleration and handling, all with a much safer feel to it. MPG - great mpg - around 75 mpg even with the way I'm riding it. I need to have the front disc brake looked at - doesn't feel like it's doing its job when used alone - really have to squeeze hard to get any power out of it. Manual that comes with it is really pretty sparse in its information. I've contacted Carter Brothers and they're sending me a service manual for $5 plus shipping (I've read other places where people got them free - guess they don't do that any more). Gas cap - The guy I bought it from, who works at a SYM dealership, told me that if you don't align the arrows on the gas cap the cap will still go on, but it will burp gas out. It should be made that the cap only goes on if the arrows are aligned. Storage - underseat storage holds my open face helmet (size XL), but there's a bump in the bottom that means my lunchbox has to get squished a little when transporting it. Of course most motorcycles have NO storage and all I need to do is attach a trunk, but I like the clean lines of having no trunk. As you can see, most every con is a trivial thing - really very few nits to pick. OVERWHELMINGLY happy with this purchase!!!! Compared to something like a Vino 125... well, there really IS no comparing them. Vino may be cuter, but this thing blows it away.